A bank holiday weekend and a chance to get out into the garden. Or, as this is Manchester, plan the jobs and then watch Netflix all day because its raining. In the end the weather was dry so…..
We have been using the patio for the last few weeks by ignoring the rubbish that had accumulated and the weeds growing between the pathing. A table upside down because the leg had fell off can be ignored if you, have another table, and can sit facing the other way. So time for a tidy up. This year I have decided to try growing hostas in pots on the patio. Some of these have come from my garden others are new additions. When I created the central border I just removed a section of the path. I added one flag stone under the arch when this was put up but this was not no connected to the path. The grass in this area has taken a lot of damage during the winter. So I decided it was time to relay some of the pathing stones slightly curing the path under the arch. I have laid these on sand leaving large gaps to allow the square slabs to curve to meet the arch. I will plant the gaps with Thyme and Camomile. 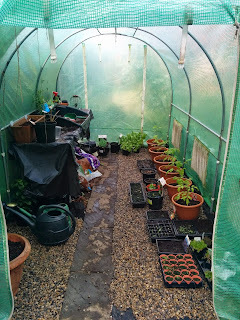 When I put the polytunnel in its current position last year I laid the path down the centre but didn’t level the the sides of the floor. I just covered then in a weed suppressing membrane and left them. This was fine for some of the area but trays were sitting unevenly and it didn’t look very tidy. As part of my getting the most from my greenhouse push I decided to level the floor and put gravel down. I still need to complete the section under the bench. The two barrow loads of soil I have removed will come in handy to help level the front garden. Now tomorrow I can go back to work for a rest.